Located above the Guttenberg Gallery, the Creativity Center is a community art studio with no sitting fee. Guests are invited to choose a project and use the studio space to create, with guidance from trained studio volunteers as needed. Paint your own pottery, or throw a pot on one of the studio's four wheels. Make a mosaic, paint on glass, or create a glass fusion piece - or choose one of many other creative outlets available. Glazing pottery is one of the most popular projects we offer. It's easily accessible for children, and adults can make their projects as easy or complex as they desire with our wide selection of bisque. Please allow at least two weeks for drying and firing of painted pottery pieces. Warm glass fusion is a great project for adults, even those who've never worked with glass. Glass projects range from small pendants and nightlights to large bowls and vases. The process involves layering glass in abstract or specific designs and then the glass is kiln fired. You will LOVE IT! Mosaics are a fun project for many ages. Glass pieces are glued to forms and our volunteers will grout and paint to complete your project. Call us to set up a date with one of our textile dyers, then learn to use inks, bleeding tissue paper, and markers to design a silk scarf. Volunteers will also help you heat-set your design. 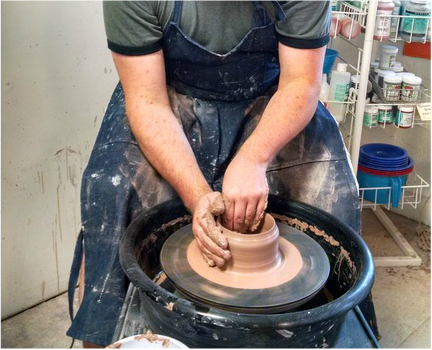 Call to find out when our house wheel potter is available to teach you and your pals how to use the pottery wheel. You'll learn to center, open, and pull pots, and it's only $5 to experiment as much as you like! The primary purpose of the Creativity Center is to host an after school art program for area youth. At this time we host children from the 4th grade and up two days a week.